Mary Meeker’s annual Internet Trends Report is must reading for any business leader these days. It provides a high level overview of many relevant issues and trends affecting the marketplace for many businesses. This year, I reviewed the 196-slide presentation and highlighted those slides that jumped out at me. I hope in some way it is helpful to you. 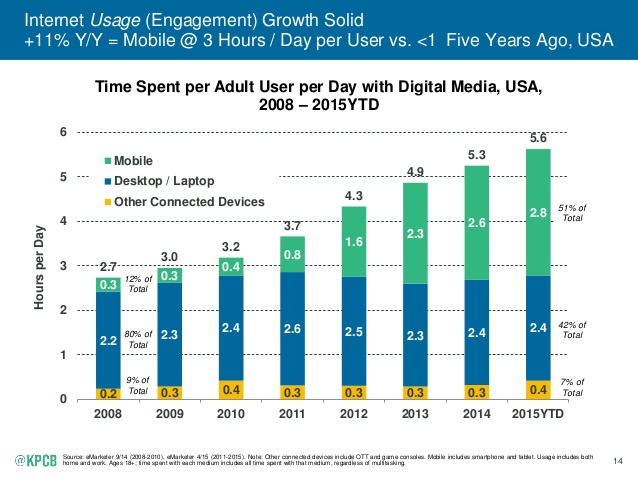 Slide #14: We spend twice as much time online as we did in 2008 and half of that time is on mobile devices. Back in 2008, our phones were for making calls. Today, our phones are for mapping locations, researching products, booking lunch reservations, banking, taking photos, sharing photos, social networking, texting, checking email…and, of course, making calls. 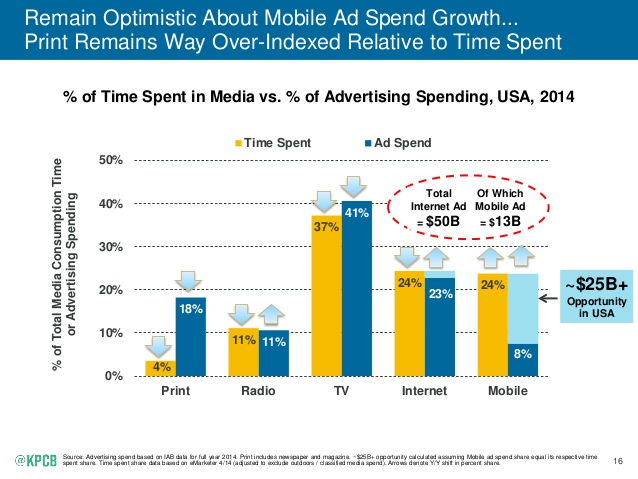 Slide #16: If you’re still advertising in print, it’s probably time to take a look at internet and mobile. Look at the gap between time spent reading print and the proportion of the ad spend. Unless those ads are producing unbelievable results, we can expect print advertising to continue to collapse while mobile advertising has abundant room to grow. 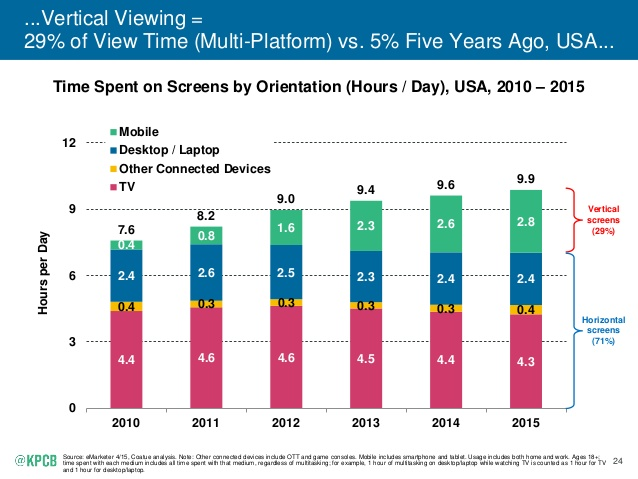 Slide #24: Vertical video is a thing. This complicates the video space. Do you produce for horizontal or vertical viewing? Viewing one type of video orientation on the other type of screen is less than optimal. Frankly, this just confuses me. Wish I had a clearer message of the way forward here. 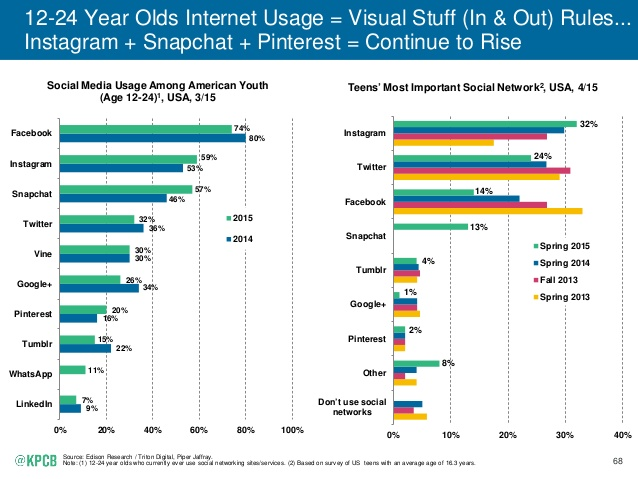 Slide #68: 12 to 24 year olds are the trendsetters and they are turning their backs on Facebook. Though abandoning Facebook, they are embracing other messaging apps like Instagram, Snapchat and others, which are becoming a new kind of platform. Twitter seems to be faring pretty well, but Google+ looks weak in light of this data. Slide #69: A Millennial’s smartphone is rarely beyond their reach. I’m partial to the Millennial attitude in this regard, even though I straddle the demographic border between Gen X and Boomers. I have a hard time understanding the unplug movement as anything but a quaint echo of the good old days before we were wired. We are not going back to being disconnect unless we’re trying an experiment for a day or a week so we can write an article about it. Slide #74: Our connected mobile lives is making us more demanding. Everything. Now. If you can’t put it on an app and get it when you want it, it will cease to exist. OK, that’s an overstatement. But, we are becoming more demanding as consumers and service providers will need to keep up. 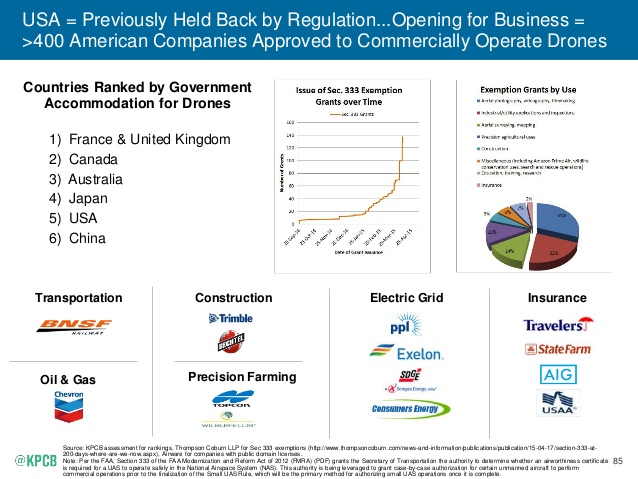 Slide #85: Consumer and commercial drone use on the verge of exploding. Governments are opening for business and Canada ranks second in accommodating this surge of drone use. Drones could be game-changers in the coming 3-5 years as they start finding their way into many industrial settings. 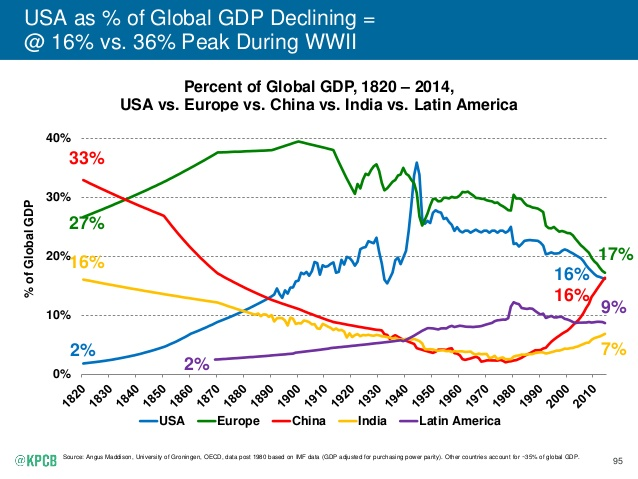 Slide #95: US and Europe are in economic decline. 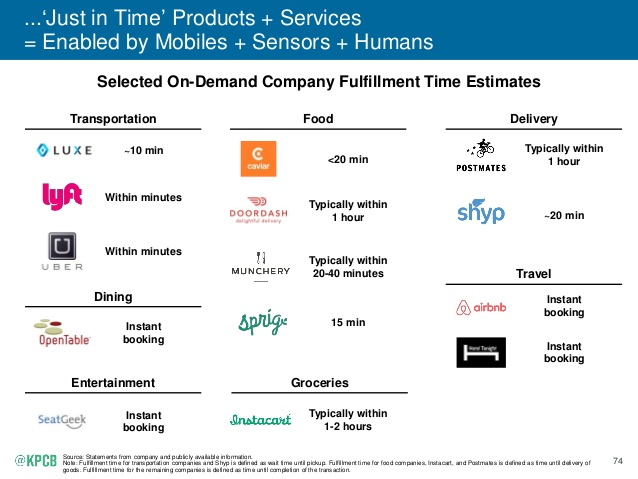 This slide seems to be a perennial favourite for Meeker and I love its breadth. So much history in one visual. And it just invites you to extrapolate 3 or 4 or 10 decades from now and imagine what lies ahead. 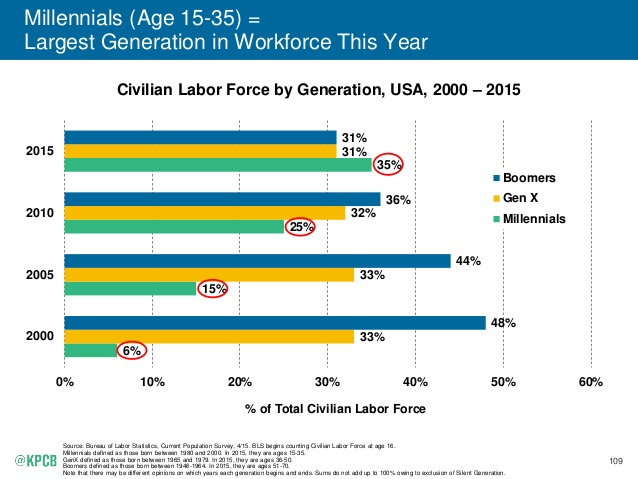 Slide #109: Millennials are the largest generation in the workforce and will shortly dominate. If you’re an employer, it’s time to focus on the Millennial worker in your business. 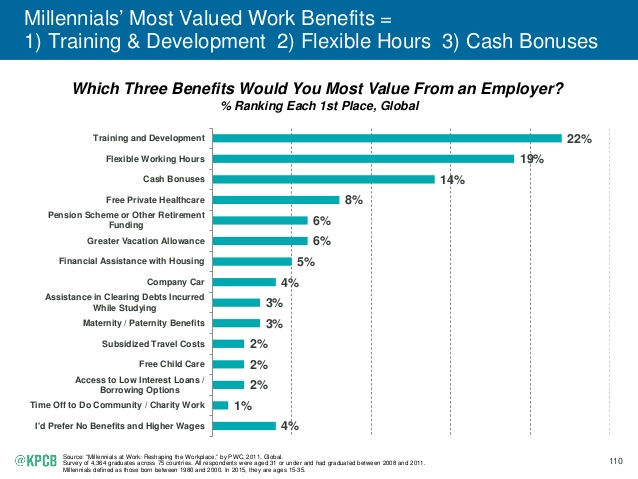 Slide #110: Millennials want to learn on the job and work flexible hours. I’m not an HR expert by any means, but this foreshadows the future of work: flexible teams and times when you can get work done, coupled with a commitment to lifelong learning in almost any field. Things are changing so fast that the luxury of coasting in one job for a decade or more is not going to be the working world that my children enter in a decade. 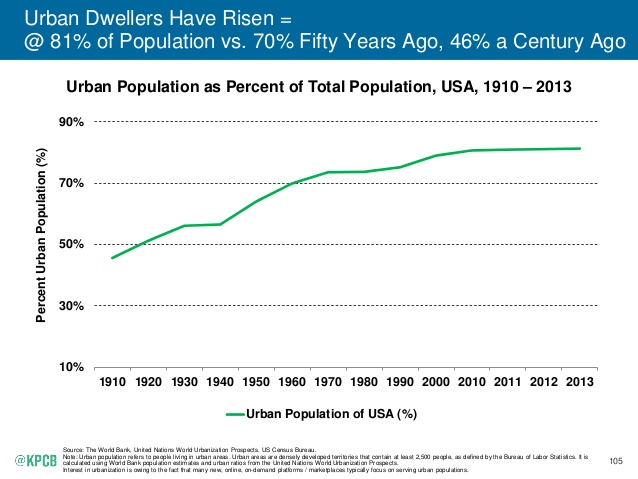 Slide #105: Urbanization is a stark reality everywhere on the planet. In the US, along with every other country in the world, the concentration of populations in urban areas is going to to have radical impacts on our economies and ecosystems. 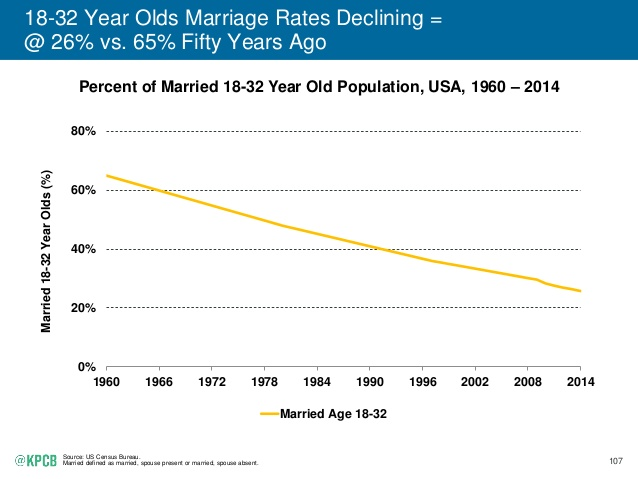 Slide #107: Increasingly, these urban-dwellers are single well into their 30s. And this has significant implications for the economy that you can see in any city. Restaurants, bars, nightlife, and recreational sports and activities – all serving the lifestyle needs of young people with disposable income, no dependents and time on their hands. Are they buying starter homes? Probably not for a while. Are they procreating? No rush. Life is good. 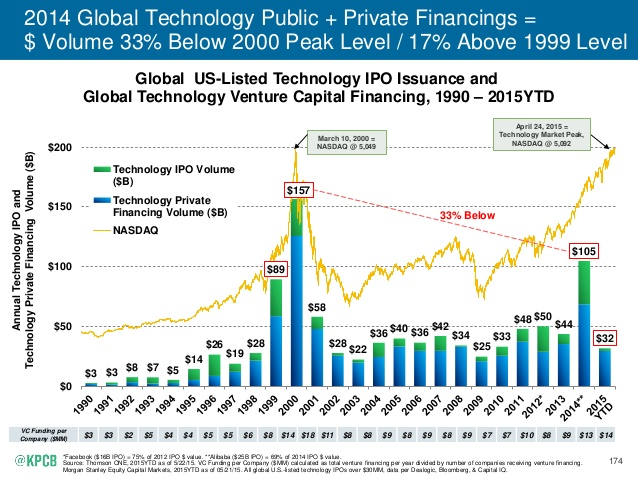 Slide #174: Are we in a tech bubble? It looks awfully reminiscent of 1999-2000. There’s a lot of capital sloshing around and everyone’s looking for the 100-bagger. View the full 2015 Internet Trends Report by Mary Meeker.